Fire and evacuation diagram is not just a good idea and it is required by law to meet most local fire codes. Wide variety of emergencies both man-made and natural, may require a workplace to be evacuated. These emergencies include - fires, explosions, floods, earthquakes, oxic material releases and workplace violence, etc. 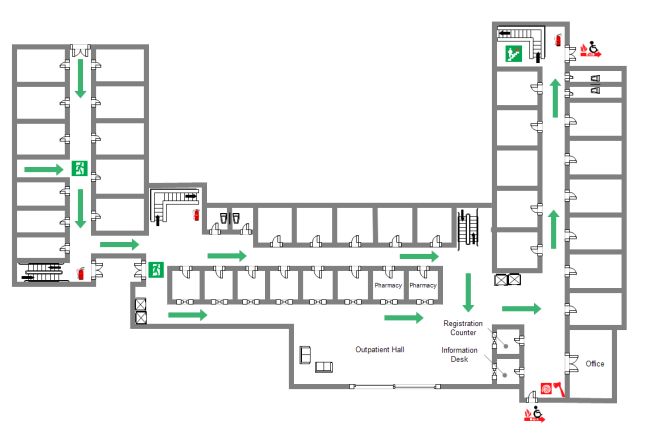 Fire and evacuation diagrams clearly display the workplaces that can be evacuated in the emergencies. Therefore, fire and evacuation diagram is of great importance for our daily life. What is Fire and Evacuation Diagram? Fire and evacuation diagram is actually a safe, compliant fire evacuation map. Fire and evacuation diagram helps move people from danger to safe areas during an emergency. Fire and evacuation diagrams are usually displayed on a bare wall in easy view of the surrounding area. Fire and evacuation diagram is of great importance to peoples' lives. Drawing a fire and evacuation plan has never been easier with the help of fire and emergency software. Additionally, our fire and evacuation diagram maker also offer a variety of printing choices like pdf, eps, ps, bmp, jpeg, word, etc. The picture above is a fire and evacuation diagram made via fire and evacuation diagram software. Keep it Simple. This is a case where less detail is better. The faster and easier that someone can look at your fire and evacuation diagram and find out what they need to know, the better. Calm thinking goes out the window during a crisis, and the goal here is to save lives, so only the important elements need to be displayed. Elements to Show. The basic layout of the property including walls and doors. Show the outside of the property as well because you need to indicate a marshal or congregation area for people to go to in the event of an emergency. The starting point, the compass, exit points, the marshal area, fire extinguishers, first aid kits and stations, other important elements should be on your fire and evacuation diagram. Display it in High Traffic Areas. For an evacuation map to be useful, it has to be visible. Display it on a bare wall in easy view of the surrounding area. If you have multiple maps, make a different map for each diplay location with a unique "you are here" element. If you have grasped the drawing techniques mentioned above, then it became quite easy for you to draw fire and evacuation diagrams on your own. 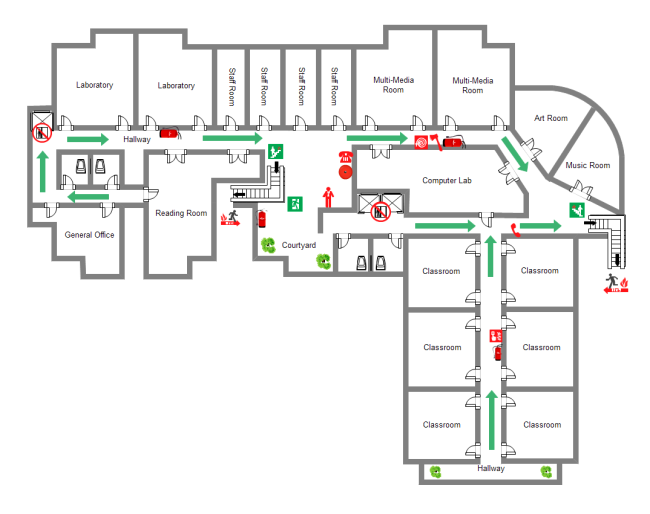 Below is a school fire and evacuation diagram template. Fire and evacuation diagrams are a vital part of your overall emergency preparedness planning. Hope you can make fire and evacuation diagram on your own soon.